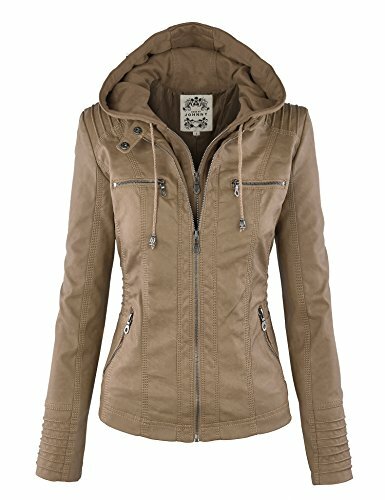 WJC663 Womens Removable Hoodie Motorcyle Jacket S KHAKI | What Should I Say? A 2-for-one motorcycle jacket. Faux leather jacket featuring a removal knit hood and front panel with exposed zipper. Pintucks details on shoulder, waist and sleeve. Double snap collar. Metal exposed front zipper placket and pockets. Fully Lined. Medium weight. 22" Length, 34" bust, 30" waist, and 24" sleeve. Measured from size X-Small.